A team of California researchers has developed a robotic gripper that combines the adhesive properties of gecko toes and the adaptability of air-powered soft robots to grasp a much wider variety of objects than the state of the art. Researchers will present their findings at the 2018 International Conference on Robotics and Automation May 21 to 25 in Brisbane, Australia. The gripper can lift up to 45 lbs. and could be used to grasp objects in a wide range of settings, from factory floors to the International Space Station. Geckos are known as nature's best climbers because of a sophisticated gripping mechanism on their toes. In previous work, researchers at Stanford University and the Jet Propulsion Laboratory recreated that mechanism with a synthetic material called a gecko-inspired adhesive. This material was used primarily on flat surfaces like walls. In the current work, researchers joined forces with engineers at the University of California San Diego. The team coated the fingers of a soft robotic gripper with the gecko adhesive, allowing it to get a firmer grasp on a wide range of objects, including pipes and mugs, while still being able to handle rough objects like rocks. The gripper can also grasp objects in various positions, for example gripping a mug at many different angles. Researchers demonstrated that the gripper could grasp and manipulate rough, porous and dirty objects, such as volcanic rocks–a task that is typically challenging for gecko adhesives. 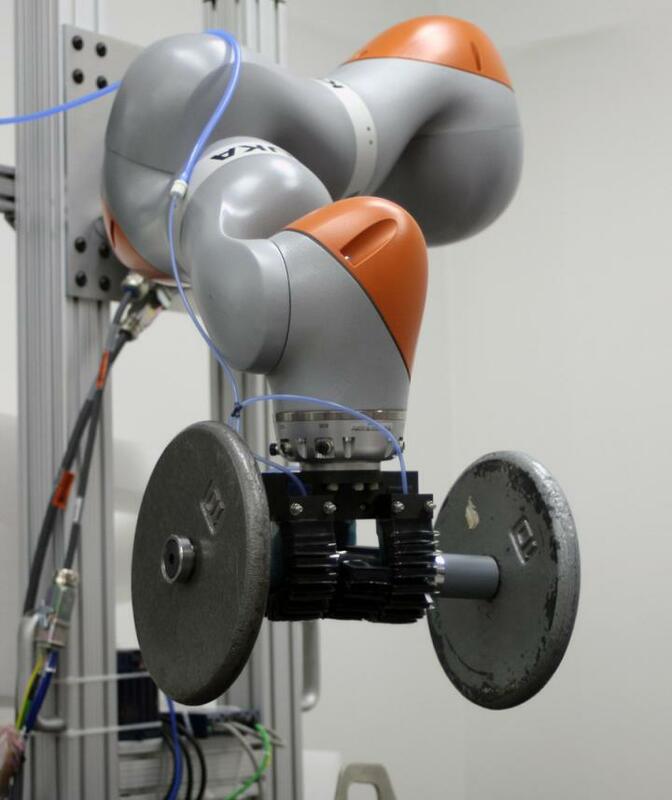 It also was able to pick up pieces of large, cylindrical pipe–a task typically difficult for soft robotic grippers. "We realized that these two components, soft robotics and gecko adhesives, complement each other really well," said Paul Glick, the paper's first author and a Ph.D. student in the Bioinspired Robotics and Design Lab at the Jacobs School of Engineering at UC San Diego. The gecko is one of nature's best climbers, thanks to millions of microscopic hairs, with features about 20 to 30 times smaller than a human hair, that allow it to climb on virtually any surface. The hairs end in tiny nanostructures that interact at the atomic level with molecules on the surface the gecko is trying to grip. This interaction, powered by what is called van der Waals forces, causes the gecko's toes to easily attach and detach as needed. Researchers at JPL use synthetic materials and similar arrays of microscopic features to harness the power of van der Waals forces and showed these adhesives retained many of the same properties as the toes of animal that inspired them. Because gecko adhesives are powered by molecular interactions between surfaces, they work best when they have a large contact surface area. Coating the inside of the soft robotic fingers with these adhesives maximizes the amount of surface area they make contact with, ensuring a better grip. The engineering team solves two different problems in this paper. First, researchers at UC San Diego set about making sure that the gripper's fingers would maintain constant contact with the surface of any object. A common problem with air-powered soft fingers is that they tend to bulge in the middle when inflated, reducing this surface contact. Glick found a study from the 1970s that provided the equations needed to solve the problem in the design process. This allowed researchers to make the gripper apply the correct forces along the entire length of the fingers. Secondly, the researchers focused on distributing forces on surfaces that aren't flat to optimize the performance of gecko-inspired adhesives. The researchers found a way to distribute force along a soft, flexible gripper, while maintaining the manufacturing precision required for the adhesives. The team did this by using a high-strength fabric embedded in the finger that can easily bend but resists stretching to support larger loads. The fingers are rigidly clamped to a base, which keeps the easily stretchable silicone from deforming beyond what is needed. This combination of soft and stiff materials lets the gripper conform to many objects while withstanding large forces. The gecko adhesives themselves are made in a three-step process. An original master gecko adhesive mold with millions of microscopic structures is made in a clean room using a photolithography process. Then, wax copies of the master mold can be made at low cost. The researchers then can make as many copies of the adhesive sheets from the wax mold as they often as want by using a process called spin coating. This allows them to make 10 to 20 adhesive sheets in under an hour. Meanwhile, the soft robotic gripper itself is cast in 3D print molds and is made of silicone-based rubber. Next steps in the research include developing algorithms for grasping that take advantage of the adhesives, and investigating the use of this gripper for zero-gravity and space operations.